Servant Leadership – Part 2. • Run Hard. Rest Well. Servant Leadership – Part 2. At this website we spend a lot of time challenging each other to embrace the God-ordained rewards of a guilt-free rest. It’s a counter-cultural commitment and requires accountability and encouragement every step of the way. This is a goal of Run Hard. Rest Well., but it is not the goal. Run Hard Rest Well. champions rest to empower God’s people to live healthy, vibrant, Kingdom focused lives. There’s a call, Kyle Idleman reminds us, to be a Follower of Christ, not a Fan. We need to trade sitting in the stands with sitting at His feet—there to listen well, equipped to move into the world empowered and unshakable. We’re being called to live lives that defy the Christianized commitment to comfort and complacency, content with mediocre standards of who we are and what we’ve been called to do if there is to be change, but guilt cannot be a part of the equation. It gets us nowhere. Conviction, on the other hand, is of the Spirit. It leads to confession. Change begins at the foot of the cross. 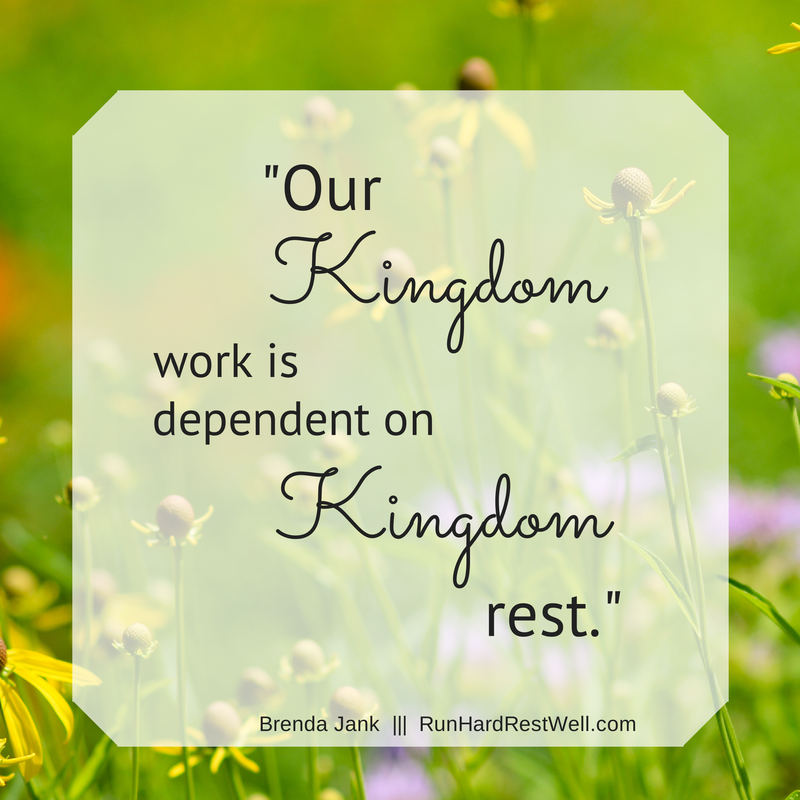 Our Kingdom work is dependent on Kingdom rest. Well rested, we are suited to listen, to attend with full abandon. Engaging in a rest that refreshes (not one that merely entertains), removes the cobwebs from our hearts, the blinders from our eyes, the cotton from our ears. The Word of God, the Voice of God intimately spoken and fully received changes lives. It transforms our hope, our vision, and our ability lay down our pain, our shame and pick up our cross. Cross carriers have front row seats to Resurrection power (Philippians 3:10). Servant Leadership at its best. Where does your comfort get in the way of your commitment? Did you catch part 1 of this series on Servant Leadership? Servant leadership. Seems like an oxymoron in today’s culture. Rest must play a part. “NO!” must play a part. Delegation must play a part. No one person can do it all. Serving in my abilities can be leadership in that area. I have to trust God to put me where I belong! I like the thought of “rest that refreshes (not one that merely entertains)”. I think that’s difficult to distinguish between, but important! And I’m sure it’s different for every person. Any thoughts on how to be sure that I’m getting “rest that refreshes”? That’s an awesome question we all need to be asking ourselves. Here’s a few thoughts. 1. It can change. Most of the time, the rest that refreshes my soul is a few quiet hours off the beaten path, outside and alone with God. But sometimes I need people. I need to connect, share, weep, pray, laugh. 2. We need to explore this whole idea and we need to expose others to this idea. And we really NEED to open the door for children and teens to explore how they best find “rest” with God. Gary Thomas has a great book called “Sacred Pathways.” Excellent read. 3. We need to take inventory. Are we exhausted? Sleep might be the first order of the day. Do we need to let down and have fun? Laugh out loud. 4. In our exploration of a rest that refreshes maybe we need to ask ourselves one question. Because of this “rest” (in whatever form it takes) am I more equipped to move into my work with energy and joy. Jean — rest well! Guilt-free! In your quest, what are you discovering about yourself?